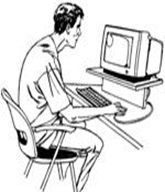 At Total Body Chiropractic we have a great interest in observing poor or bad posture. We give numerous pieces of advice to correct the posture and specific exercises. Our spines are ‘S’ shaped, with a very important hollow in the small of our back, known as the lumbar lordosis. The lordosis is lost whenever the spine is curved in a ‘C’ shape, such as when sitting slumped, lifting or bending forwards. Problems begin to occur in the lower back if the lordosis is lost for prolonged periods of time. When the lordosis is lost for a prolonged period of time, the ligaments which link the vertebrae together are overstretched and pain is produced. In just the same way it is uncomfortable if you bend your finger backwards and hold it. Now push your finger a bit further, and pain will be produced. You are overstretching your finger and the pain is telling you to stop doing it, as if you push it even further, the ligament will eventually tear. No damage results from short term strain, providing the pain warning is listened to. However, if the ligaments are torn, a pain will be produced which is more severe and will continue even when the finger is resting. The finger would heal in a few days; however, if every day it was pushed backwards repeatedly, the healing process would take longer. Back pain occurs in just the same way. If we repeatedly allow ourselves to slouch or adopt ‘C’ shaped postures, the ligaments which cross the vertebrae will be strained, and will produce pain. More severe pain will be produced if the ligaments are overstrained. 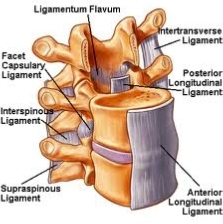 Unlike in the finger joints, the ligaments which support the spine and connect the vertebrae also form the retaining walls of the discs. Over stretching can therefore affect the discs. This can result in the disc losing its shock absorbency, and with a weakened outer wall the disc can begin to bulge. If the disc bulges far enough, it will affect the sciatic nerve and cause leg pain or numbness, tingling or weakness. To help you think more about how the discs work, consider again the structure of the spine, a string of vertebrae like cotton reels. To allow flexibility, there is a disc between each pair of vertebrae. The disc is mobile and you can think of it moving a little like a bar of soap between your hands. As you bend forwards the disc moves backwards, just as when you close your fingers together a bar of soap would move towards your wrists. You can prevent the bar of soap moving any further backwards by squeezing your palms together, just like when you come upright after bending forwards. However if you bend forwards or slouch for a prolonged period of time the disc material can move so far backwards that it becomes painful and the ligaments strain. If the disc material displaces far enough it will be very painful. You may have symptoms in your legs and you may be unable to stand up straight. It is possible to reverse this displacement; however, care must be taken to identify the right course of action. Recent information on normal placement of the upright spine reveals the importance of head position in relationship to your body. It is extremely important that the position of the cervical spine allows your head to sit back on the top of your shoulders. Sadly, the effects of gravity, poor posture, the weight of the head, or past trauma will cause neck and skull misplacement leading to something called “Forward Head” syndrome, meaning the forward displacement of the head where your chin is out in front of your shoulders and chest which causes pathological tension on the spinal cord and brain stem and it usually hurts around the top of your shoulders. Incorrect head positioning leads to improper spinal function. The head in forward posture can add up to 15 kg of abnormal leverage on the cervical spine. Forward head posture results in loss of vital lung capacity then heart and blood vascular problems. The entire gastrointestinal system is affected, particularly the large intestine. Loss of good bowel peristaltic function and evacuation is a common condition that comes with forward head posture and loss of spinal lordotic curves. Forward head posture causes an increase in discomfort and pain. Freedom of motion in the first four cervical vertebrae is a major source of stimuli that causes production of endorphins in production many otherwise non-painful sensations are experienced as pain.